Photo Release -- Northrop Grumman Shipbuilding Employees Donate $2,500 to the Newly Re-Opened Armed Forces Retirement Home in Gulfport, Miss. PASCAGOULA, Miss., Oct. 1, 2010 -- Northrop Grumman Corporation (NYSE:NOC) Shipbuilding employees worked together to raise $2,500 to go to the training detachment that assists the residents of the Armed Forces Retirement home in Gulfport, Miss. The residents are moving into the re-built home on Monday, Oct. 4 for the first time since Hurricane Katrina destroyed the facility on Aug. 29, 2005. "Our shipbuilders have big hearts and once again they reached into their pockets to send a strong message of support to the residents of the Armed Forces Retirement Home," said Northrop Grumman Shipbuilding vice president Tim Farrell, the executive sponsor for VERT. "One of our company commitments focuses on improving the health, safety and quality of life for our employees. 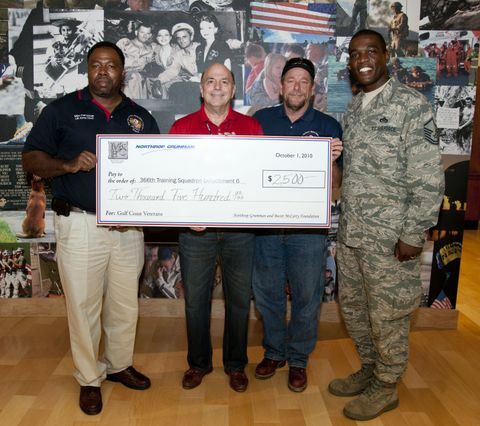 But this also reaches out to our communities and especially to our Gulf Coast veterans." "The residents of the Armed Forces Retirement Home are very excited about returning to the Mississippi Gulf Coast," said Sheila Abarr, public affairs officer for the Armed Forces Retirement Home. "This donation by Northrop Grumman to the Sergeants First Class Association for our residents emphasizes the strong tie that active duty personnel have with their comrades that went before them. The AFRH looks forward to partnering with the Gulf Coast communities."